VAN ERT ENTERPRISES: Excellent source for nest boxes, sparrow traps and mealworm feeder! DELUXE REPEATING SPARROW TRAP: Trap multiple sparrows and starlings with ease! BLUEBIRD LOVE (www.bluebird-love.com): A small family Business offering a unique mealworm feeder and quality nest boxes. FOR THE BIRDS: Handmade birdhouses and birdfeeders for bluebirds, wrens, finches, and chickadees. Many of the bird houses and bird feeders feature the Cape Hatteras Lighthouse painted on them. KRITTER KRAFTS by KAROL: A fledgling business offering bluebird houses, plain and hand painted, meal worm feeders and also some crochet & craft patterns. The following links should prove useful to anyone interested in Bluebirds. Please notify herper@tripod.net if you have site suggestions or have found broken links. Meet Donald & Lillian Stokes and find out about their new programs. My own design for Eastern Bluebirds, if you'd like to build your own. Be sure to visit this site. Check out Rosebud's beautiful bluebird page. 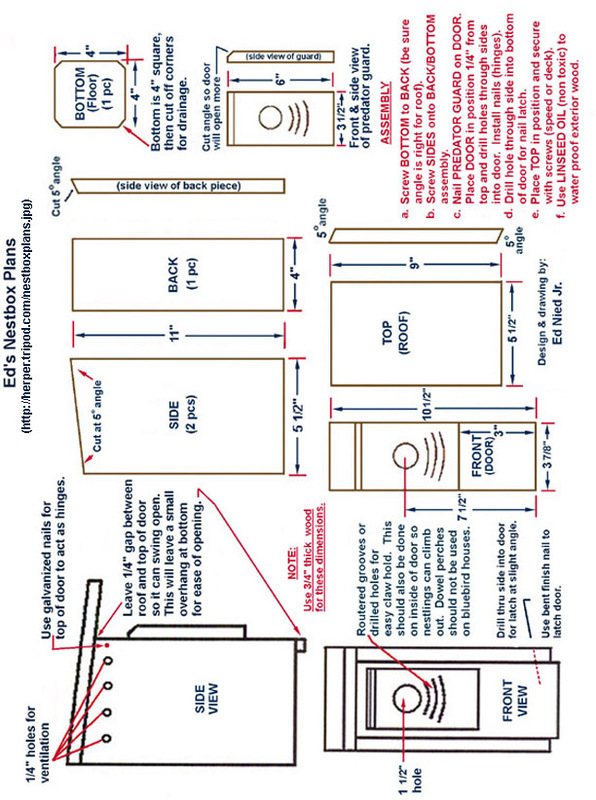 Detailed plans for building a Peterson nestbox. A terrific new site for WESTERN bluebirds. A special interest website for North Carolina residents. You can also visit their Bluebird Information Page below. Check out Chris Walker's nest photos from Texas. More bluebird & tree swallow information. You will also find a unique nestbox design for woodpeckers and information about the sand dunes of Long Island, NY. Another terrific and informative site. Check out Matt's great pages. Rick has a lot of valuable bluebird information on this page! Relatively new. Good information and forum. A comprehensive guide for all your bluebird needs.